On June 1, 2018, the Commission on Professional Credentialing (CPC) welcomed Chief David Emanuel as a Commissioner representing Combination Departments. The CPSE Board of Directors unanimously approved his appointment. 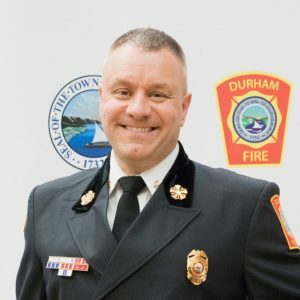 Dave Emanuel is the chief of the Durham Fire Department; which serves the Town of Durham, New Hampshire, and the University of New Hampshire (UNH). Dave began his career in Durham as a call firefighter in 1991 while a student at UNH. He became a career firefighter in 1997, captain in 2008, assistant chief in 2015, and chief in 2018. Dave served in leadership positions within the Durham Professional Firefighters Association and Durham Municipal Managers Association for over sixteen years. He is an instructor for the New Hampshire Fire Academy and delivers leadership and educational programs at national conferences. Chief Emanuel holds a Master’s Degree in Public Administration and bachelor degrees in Business Administration and Civil Engineering from UNH and is a licensed NH Professional Engineer. He is a candidate to complete the National Fire Academy’s Executive Fire Officer Program in 2018. He earned his Fire Officer designation in 2008 and Chief Fire Officer designation in 2010. Learn more about the individuals that graciously volunteer their time to oversee the credentialing process.